Coconut products are quite popular these days, not only for their flavor but because it's great for those who are lactose intolerant. I grew up watching my mom use coconut milk in several Filipino dishes and I appreciate it's flavor and healthy attributes in dishes I now cook as an adult. This one in particular is one of our favorites. The coconut milk tenderizes the chicken while imparting a sweet, rich flavor and a touch of creaminess. Paired with ginger, it adds a nice bite to balance out the richness. The marinade is also great for pork and seafood, but chicken is our favorite! Soak wooden skewers in water for 1 hour prior to grilling. Prepare marinade by combining oil, coconut milk, ginger, seasonings, brown sugar and soy sauce in a large storage bag or storage container. Add chicken, toss to coat and refrigerate 1-2 hours, or even better, overnight. Preheat grill to 375°F (a medium-hot fire). While grill is warming up, remove chicken from marinade allowing excess marinade to drain back into bag (do not discard marinade). 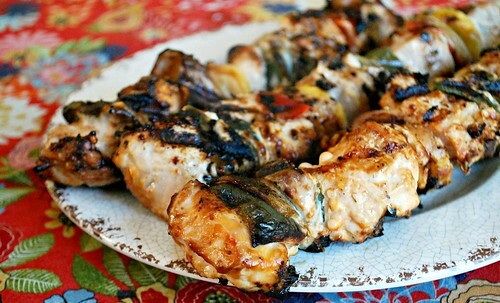 Thread chicken and vegetables onto skewers, alternating chicken and vegetables on each skewer. Transfer marinade in a saucepan on the stove over medium heat. Bring to a boil, reduce heat and allow to simmer until sauce is reduced to about one half. Set aside and keep warm. Spray or rub grill grates with oil. Place skewers onto prepared grill. Sprinkle chicken lightly with sea salt and freshly ground black pepper and grill until cooked through and golden brown, turning often, about 8 minutes. Do not over-cook. Allow chicken to rest 2-5 minutes. Serve with steamed jasmine rice. Serve with sauce drizzled over top or on the side for dipping.